Editor's Note: Enough Project Policy Alerts provide a reaction and set of recommnendations to a significant development designed for policymakers, advocates, and other influential people participating in the policy making process. The Ugandan army has suspended its operations against the Lord’s Resistance Army, or LRA, in the Central African Republic, or CAR, and U.S. military advisors have also suspended their counter-LRA operations in the country. According to sources, the Ugandan government is divided about remaining in CAR, with some using recent developments in Bangui as an argument for a speedy end to counter LRA operations. The U.S. and Ugandan governments must remain deployed to protect civilians from retaliation and to arrest top LRA leaders. Should the U.S. military advisors and the Ugandan army prematurely withdraw, the consequences will be disastrous. In the absence of any military pressure, the LRA will likely use the security vacuum as an opportunity to regroup, reorganize, and abduct more fighters. LRA attacks could easily increase and it could see its ranks grow. The gains made thus far by the advisors and their partners would likely be reversed. Undoubtedly, civilians in the region would bear the brunt of the consequences. The LRA killed more people in CAR last year than in any other country in the region, and CAR is currently the epicenter of the fight against the brutal armed group. The Ugandan army is the only force in the region regularly conducting offensive operations against the LRA, and they do not have access to the Congo. Thus, a withdrawal of Ugandan forces from CAR would effectively end military efforts to dismantle the LRA. Since deploying in late 2011, U.S. military advisors have had a significant impact on efforts to apprehend the LRA’s senior leadership, protect civilians, and promote defections. The advisors are improving the gathering, analysis, and sharing of intelligenceabout the LRA. They convene the local actors to meet on a regular basis in order to improve information-sharing and coordination. Their continued deployment on the ground in LRA-affected areas is instrumental in supporting efforts to end the LRA. In 2012, 20 Ugandan adult males reportedly defected from the LRA or were captured. This represents a major blow to the LRA’s size, strength, command, and cohesion, as Ugandan commanders and fighters are nearly impossible to replace. LRA attacks have decreased throughout the region. In South Sudan, where there have not been any LRA attacks since late 2011, many displaced communities have been able to return home. The United States, Uganda, and the international community must stay the course and work through the African Union to find ways that will allow the counter-LRA operations to continue despite the unrest in CAR. Read the full statement by the Enough Project, Invisible Children and The Resolve here. 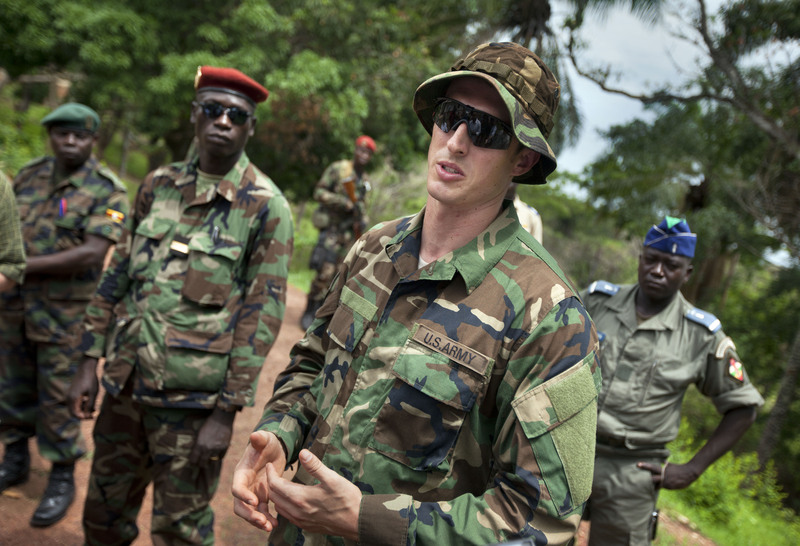 Photo: U.S. military advisors in central Africa (AP).